EIZO is set to showcase its latest product developments alongside many current screen models at ECR. 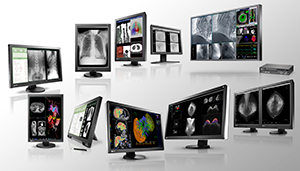 EIZO will present its RadiForce line of high-quality medical monitors for image viewing and diagnostics from March 7 to 10. The latest Multi-Modality monitors, the RadiForce RX650 and RX850 six and eight megapixel color monitors guarantee precise display of color and monochrome images on the monitor. The size and format of the screen allows users to organize images to suit their needs. This makes it ideal for work processes in radiology, with no obtrusive bezels typically found in a dual-screen configuration. Single-monitor systems with the RadiForce RX650 or RX850 also take up less space than solutions with two monitors. The luminance characteristic curve is set during production in accordance with the DICOM standard to ensure that tone value differences are displayed correctly. A front sensor integrated into the monitor’s bezel (IFS) is used for precise and easy calibration, reducing the time and maintenance costs associated with image quality control. EIZO uses DICOM-preset monitors for viewing in clinical departments for accurate image reproduction allowing medical professionals to receive the necessary DICOM grayscale value at the touch of a button. Representing the MX product series, EIZO will showcase its latest product at ECR – the RadiForce MX215. EIZO will also present its quality control software, RadiCS. The program provides extensive checks and automatic adjustment to ensure constant and consistent image reproduction on all RadiForce monitors. 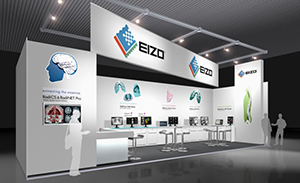 The EIZO stand is located in EXTENSION EXPO A, Stand 9.